We live in an era where smart phones and tablets are an integral part of our lives. Now there are more people browsing the internet on mobile to those using a desktop computer. There will be 2 billion of smart phone users by 2015, according to this study by eMarketer. And more than 80% of internet users will be from mobile. If you haven’t done it yet, then you need to make your website mobile-friendly today. You don’t want to lose potential readers (or customers)! In this post I’ll give you specific options and tips to create an awesome experience for mobile users visiting your business website or blog. The trend is clear, but I still wanted to check analytics data for one of my sites. 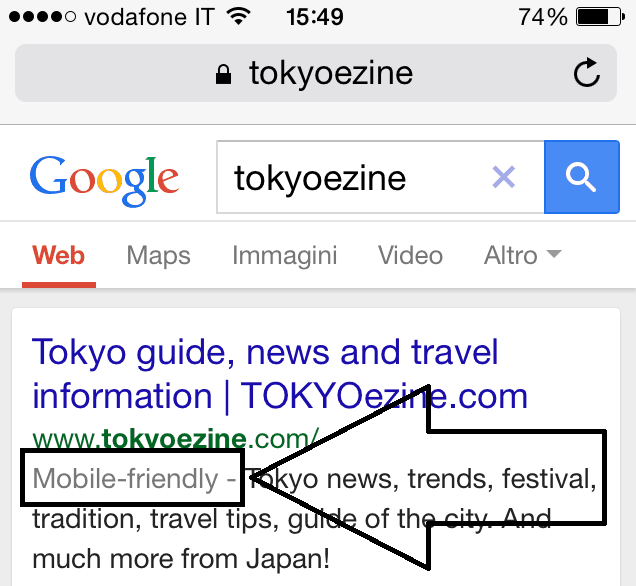 For example, Tokyoezine (my Japanese travel niche website) gets more than 64% of traffic from search engines. I’ve set the time period from beginning of November 2014 until today. 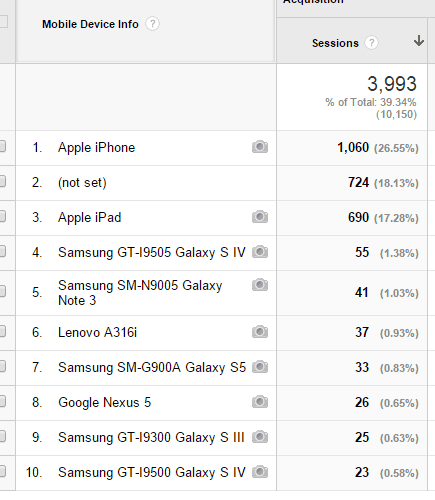 In my Google Analytics dashboard, under the “Audience” menu, I selected “Mobile—>Overview”. More than 30% of users are browsing my niche site from mobile. Under “Devices” tab, I found out that more than 26% of mobile visitors are from Apple iPhone, while 17% from iPad. The rest are from Samsung or other mobile gadgets. But I’m sure in future more visitors will land to my website from mobile devices. And you, are you using a mobile optimized theme on your blog? If you discover that more than 30% of your visitors come from mobile devices, can you ignore them? You want to put yourself in the shoes of your audience and think about how to create an awesome user experience from mobile. The first step you can take is searching for your website with Google. It’s now showing if the URL is mobile-friendly or not. Google gives you also a free service to check if your blog is ready to give mobile users a positive experience. Use their mobile-friendly test to rate your blog. The result of the test with my niche site was positive. This service will also tells you how Googlebot sees the page tested. If the result of the test with your website was positive, then congratulations! But if you still need to improve your blog to make it mobile, then you should read the following suggestions. There are different options available, most of all if you use WordPress. If you have purchased a professional theme for your blog lately, it’s likely you have already a mobile responsive theme. For NoPassiveIncome, I use a personalized Genesis Framework child theme (Magazine PRO). For TOKYOezine, the niche site I use as example in this post, runs on Spectrum, from WooThemes. Both are mobile responsive templates, with HTML5 markup. Aside from having a beautiful design, they are both easily customizable. I prefer Genesis, but Spectrum from WooThemes was updated in July of last year and now it looks really professional for an online magazine, like TOKYOezine. If you want to take blogging seriously, then I suggest you to invest some money purchasing a professional theme. If you don’t want to invest money in a responsive template, then you can use WP-Touch, a WordPress plugin that lets you build a mobile version of your blog. There are different plugins available, but this one has been the most popular and used for this purpose (it has been downloaded more than 6,5 million times). Once installed, WP-Touch will create a nice mobile optimized theme for your blog. You won’t have two different websites, but the mobile version will be shown to users landing from smart phones or tablets. The free version gives you just one default theme, so you don’t have to tweak a lot of things in the settings. Just set up the mobile menu and add the bookmark icons. And if you want more templates to choose from, you can get the PRO version. Aside from WP-Touch, some other options available are “WP Mobile Detector” WordPress plugin or “MobilePress”. Also Jetpack is a plugin that will give your website some features to make it mobile-friendly. Generally building an application would be very expensive. But there are some affordable solutions online. Chupamobile offers you interesting features to create a fantastic App for your website. They have more than 1500 templates available among a large range of categories available (included business). They also help with the process of creation and launch of the App in the Apple AppStore, Google Play and the Amazon Appstore, without knowing about coding or design. It’s a good solution for medium-large blogs or websites. Whether you choose to use a mobile responsive theme, install a plugin or build an application, you must be sure to create an awesome experience for your users landing from mobile. If you haven’t done it until today, then I strongly suggest you to take action, as soon as possible. As your mobile audience will definitely keep increasing in the future. 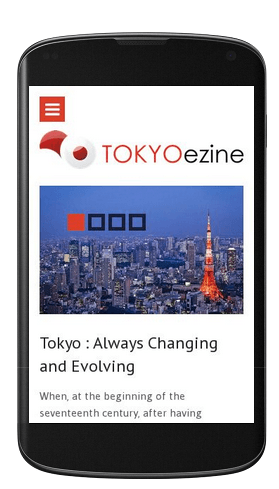 Do you have already a mobile optimized website? Please let me have your comment below, thanks! Today the number of smartphone users are increasing rapidly. So we need to make sure our website or blog is mobile responsive. I am using jetpack for responsiveness. Actually I installed it without knowing that feature. I heard about WP-touch elsewhere. But not going to give it a try as it is costly. Which is better Sir, jetpack or wp-touch? Sir I want to know whether google displays our mobile’s responsiveness in searches made by mobile only? Anyway I never knew about that feature. Hope you have an awesome. and see which one is better for you. Of course, JetPack gives you many different features for your blog, other than just the mobile optimization. As for your question, Google will display that “mobile-friendly” note on your blog result for the users researching via mobile gadgets (smart phones, tablets, etc). This post got my attention. I never though to find out if my blog was mobile friendly or not. Me using my cell everyday to check it made me think it was. Great to hear that, Vernon. Having a mobile responsive theme for our blogs is really important, seeing the increasing number of mobile users. Great post. I remember when I first started online, I was so determined to only use free themes. That’s all I did. There was no chance of me using a paid theme at all. So I started blogging for 4 – 6 months and then one day I just happened to look up my site from my phone and let me tell you …. HORRIBLE. Absolutely horrible. The theme wasn’t mobile friendly at all and the whole thing was ugly. From that point on, I decided to just bite the bullet and purchase a paid theme. And ever since I did, I love it. But I love the fact that it’s so clean on a mobile device as well. SO I really agree with this post. You need a mobile friendly blog because many people are starting to no longer view stuff on their desktops and laptops. It all about smart phones and tablets now and if you’re blog isn’t compatible, you’ll definitely miss out. I’m glad you finally purchased a responsive theme, it’s definitely worth it! I see you use Genesis, I love it too. Thanks so much for visiting and sharing your views here. Have a great beginning of this week, Andrew. This is one topic every blogger needs to know. If our blogs are not mobile friendly, we are loosing readership. I cannot tell you how many of my readers are reading my stuff from their mobile devices. Yes, I had my blog mobile ready early last year! I had to because I was getting feedback from some of my readers that my social share buttons were covering the content…. So immediately I changed it to being mobile friendly. I imagine there are a lot of your readers reading your blog via mobile devices. I changed social sharing buttons too, I got “Monarch” plugin, from ElegantThemes. It looks great, I just love it! have a great week, Donna. You made just check if my site is mobile friendly. What a great post. In today’s world where smart phones have become part of our lives, it necessary for bloggers to make sure that there website is mobile friendly. I can relate to blogs that are horrible on the mobile device, they drive readers quickly. Thank you for listing the tools that will help to achieve a mobile friendly site and thanks for sharing. Have a wonderful week. Mobile-friendliness is already and will be a major SEO signal at search engines. Moreover, as you said, more than 30% of the users visit our site on smartphones. Making a theme responsive is not that easy and also not that difficult (if we have sound knowledge of HTML & CSS). A ready-made WP plugin can do it even for a newbie. You have touched every kind of web user in this article. Hope it helps more readers to set up a mobile-friendly site. Thanks for the tip Erik, I would like to tell you that jetpack WordPress plugin has also the option to make a WordPress blog mobile friendly, I use this plugin to perform many of the tasks and I just love it. thanks for adding that comment. As mentioned in the post, JetPack gives users the option to set up a mobile version of the blog. Glad you brought this up because I was having issues recently with my mobile plugin not working correctly. It ended up being issues with my caching plugin. Some of the settings magically disappeared and of course I didn’t set it up so I didn’t know how to fix it. You sharing this test with us here on your post reminded me to check it again and sure enough, it wasn’t set up right. I went in search for the answer and resolved it all because of your post so thank you so much for that. I don’t ever search sites on my phone, I’m always at home on the computer and when I’m not I’m definitely not searching online. So I’m the last person to help others with this but I know it’s a necessity to have our sites being user friendly for those searching while on their phones. Thank you for this post and reminding me to fix this issue. Great to hear you were able to solve the issue with that plugin! Having a mobile version of the website, ready to welcome your readers landing from smart phones or tables is definitely very important. I’m glad you enjoyed the “mobile test” from Google I shared in my article. Thanks for leaving your views and for visiting today. Every bloggers needs to know about this….!! Thanks for share it with us…….!! Glad you enjoyed the post, Piyush. You just solved the biggest problem that I am facing right now. Day by day mobile users are increasing for which we the bloggers should come up with responsive site. I don’t want to change my current theme. So, in this case WPtouch is the way of hope for me. Thanks for the great help. Have nice day. Glad to have you helped, Hasir. Anyways, another of your superb article that I couldn’t help commenting on. It needs least mention that I have bookmarked both these blogs. And I have also read other stuff already. This is a treasure trove for me with invaluable tips that are indeed free of cost. Thanks for posting such useful info!!! Great to hear that, Abhijit! and I’m glad you enjoyed the content. Does a blog that is mobile friendly or has responsive design rank better in search engines for mobile traffic ? Please share your view on this. having a mobile responsive site will indeed help your rankings on search engines for mobile users. Don’t miss the chance to get a mobile version of your blog. I am going to implement your tip of building an app but I am not into technical part so I need a developer for it. Do you know any Android Developer? good to hear your website is mobile friendly! You surely understand the importance of having a responsive theme. I don’t know any Android developer, sorry. I suggested a website within this post, where you can get an app for your website/business. Thanks for visiting and commenting, Nikhil. Great post Erik, thanks for sharing these informations. Keep posting. Glad you liked the post, Sourajit. Thank you for writing an article about this. I will share it then. Happy you brought this up on the grounds that I was having issues as of late with my versatile plugin not living up to expectations accurately. It wound up being issues with my reserving plugin. A portion of the settings mystically vanished and obviously I didn’t set it up so I didn’t know how to settle it. You offering this test to us here on your post reminded me to check it again and beyond any doubt enough, it wasn’t situated up right. I went in quest for the answer and determined it all as a result of your post so thank you such a great amount for that. Have you tested your site for mobile, Rahul? glad you liked the resource mention. Good to know your site is mobile-friendly! Thanks Erik Now My Website is also Mobile Friendly. Good to hear it, Ankush. After “MobileGeddon” is really important to have a mobile version of your site. Nice and informative post. Now my site is also mobile friendly. thanks to share with us. to studying here way more often! go to show, the mobile trend will, definitely continue upward! And I actually used the WP-Touch WordPress plugin, briefly, until I could a more updated, mobile friendly theme. I’m glad you liked the way I crafted this post. I always try to add useful screenshots and practical information, to solve problems. I prefer to use a responsive theme, rather to install a plugin that creates a mobile version of my site. But of course, you need to invest to get that. have a good rest of this week, Mark. Good to hear it, Viaj. Genesis is my favorite framework! Glad to have you helped finding the mobile optimization solution, Jorge. You can also implement google’s new Project Accelerated mobile pages. Your website will load faster in mobile in a lighter version after using amp. I have implemented it in wordpress and now it opens a lighter version on mobile. Hi Erik, Superb Article but I am using Blogspot blog!